It’s interesting how we can understand what something is and how to use it, or know what it’s used for, and yet, when put on the spot, we cannot define what it is. So, when it comes to something as simple as the word “tool”, how would you define it? According to Merriam Webster, a tool can be defined as “a handheld device that aids in accomplishing a task” or “any physical item that can be used to achieve a goal, especially if the item is not consumed in the process.” When the concept of tools is considered, it really encompasses a rather broad range of purposes that can be further classified into utensils, implements, machines, devices, instruments, or apparati. While some animals have been discovered or known to employ simple tools, the use of stone tools and other early tools from human beings dates back millions of years. The use of tools contributes to human culture and was key in humanity’s eventual rise to civilized society. While the significance of tools in human history is undeniable, why exactly is Protocast Inc. starting a two-part series on the history of tools? 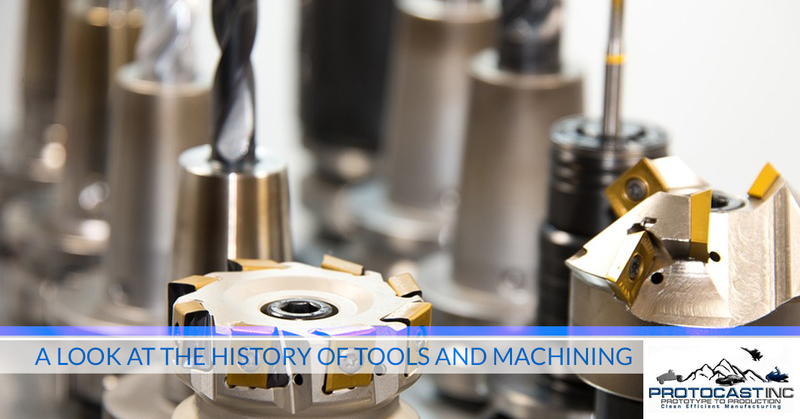 First off, that’s a small amount of content dedicated to something that scholars spend a lifetime on, and two, because our Denver machine shop specializes in tool cutting and tool making. With our precision engineering and quality CNC machining services, we’re able to create an exact prototype or production run that meets your exact specifications. Learn more about what we can do for you by getting in touch with us today! The ability for human beings to make and use tools, as we mentioned above, dates back millions of years in our family tree. Chimpanzees, our closest living relatives, can devise their own spear-like weapons for hunting and also create specialized toolkits for foraging ants. They also do these things completely on their own. This may suggest that the human family tree has possessed wooden tools since the ancestors of humans and chimps diverged some four million years ago. Stone tools date back roughly 2.6 million years to Gona in Ethiopia. Also known as the Oldowan, these fist-sized hunks of rock were used for pounding, but they were also the first known manufacture of stone tools. Sharp flakes were created by knapping or striking a hard stone against quartz, obsidian, flint, or any other rock whose flakes could hold an edge. Early stone tools stayed largely undeveloped for roughly 1.8 million years until technology and lineage began to change. This point, humans began to use more advanced handaxes and cleavers to chop through things. Marking a point in early human history known as the Acheulean, the cognitive ability to coordinate spatial and shape information that chimpanzees did not have really began to set new generations of humans apart from the rest of the natural world. It sounds a little silly, but instead of dropping tools right after use, humans began to actually carry them around. Technology eventually became more of an adaptive niche for Homo erectus, and the use of tools grew into a permanent, day-to-day thing. This change in early human’s cognitive point of view in regard to tools and the ability to manipulate the environment around them is arguably more significant than the initial use of stone tools. Well, at least from a historical perspective. In a follow-up post, the tool cutting and prototyping experts at Protocast Inc. are going to continue looking at the early history of tools. For even the most demanding tool making needs, our machine shop can handle it. Get in touch with any questions here!